A large force of dwagons. Three of the uncroaked warlords to enable the dwagons to make surgical attacks and withdraw after croaking specific targets. The Eyemancer Table to identify a good deployment location and provide command and control. Parson developed a plan to deploy a force of dwagons near the enemy column. The fastest dwagons (56+ Move) would be led by three of the five available uncroaked warlords, allowing them to selectively target enemy units and withdraw before destroying all encountered enemy forces. Their mission would be to raid the column and selectively target siege units. The slower dwagons would be deployed in a ring formation in heavy-tree terrain, creating a "fort" within which the wounded dwagons from the raids would be protected. On the next turn, the wounded dwagons would heal, and the entire force could then attack Ansom's remaining siege units and return to Gobwin Knob. When Parson developed this plan, he was working under the assumption that Ansom knew the position and status of each of his units (just as he knew the position and status of each of Ansom's units, via the linked Eyemancers of Stanley's tactical table). Before implementing the plan, he learned that this was not the case. The plan was modified to use the ring fort for deception rather than direct protection. The first phase of Parson's plan was highly successful, eliminating about 40% of the enemy's siege units. If permitted to continue, he was well situated to finish the job next turn. Ansom decided that he had no choice but to find and croak the wounded dwagons before they could heal and attack again. Flights by Vinny_Doombats' scout bats discovered a ring of dwagons. Ansom surmised that the wounded dwagons were in the center hex (unexplored because the scout bats were croaked by dwagons upon entering the ring hexes). He planned to lead his forest units around the back of the ring, to the hex containing only three dwagons, fight their way through, and croak the wounded dwagons while they were vulnerable. Figure 1 -- The portion of Ansom's column adjacent to the ring fort. 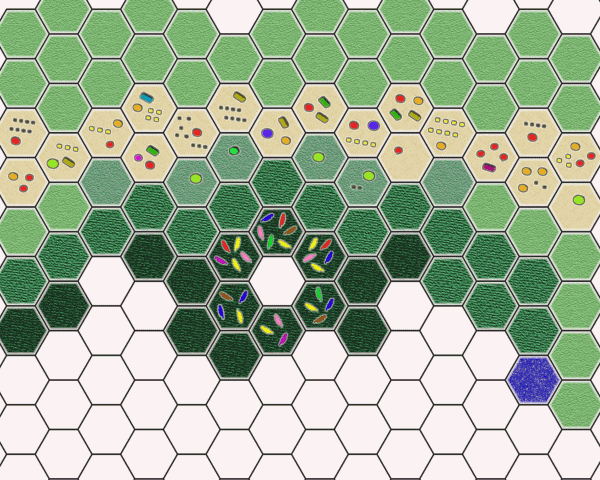 The white hexes are still unexplored by Ansom's units, and he has no way of knowing what those hexes contain. However, the wounded dwagons were in fact hovering over a nearby lake, out of reach of Ansom's ground forces. Ansom had no water units, and the air units had previously been dispatched to rescue Jillian Zamussels, putting most (but not all) of them out of range (even if he knew where to send them). Figure 2 -- The actual hiding place of the wounded dwagons. The white hexes on this map represent regions that have not been revealed by the comic; it can be presumed that Parson knows what's there, and it's not particularly relevant to his plan. After the Coalition strike force croaked the three dwagons in the weak hex of the ring, Vinny dispatched a scout bat to the center hex. To his surprise, he found it to be empty. Ansom refused to believe it, apparently suspecting that the wounded dwagons had been veiled. 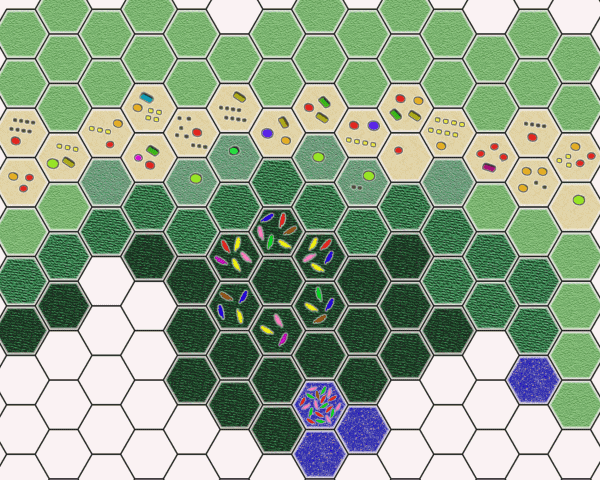 However, even when the entire expeditionary force entered the center hex, they found nothing. Figure 3 -- The situation after Ansom walks into the trap. (White hexes represent terrain unknown to Ansom; see Figure 1 caption). Vinny proposed two options: to recall the few air units with sufficient range to join them and make their stand in place or to use their remaining move in an attempt to punch through the strong hex of the ring and return to the column. Ansom rejected those alternatives, realizing that they would leave the enemy free to ignore him and chew up the rest of his siege train. Instead, he sent Jillian a message directing her to lead the air units in a search for the wounded dwagons. Jillian began to do so, but reluctantly. At last, she decided to abandon the search and rescue Ansom (and Vinny and Tarfu). However, her direct flight to Ansom's position led her directly to the wounded dwagons. Figure 4 -- Based on the local geography and the hex-based movement system of Erfworld, it can be deduced that Jillian began her beeline to Ansom (via the hole in the dwagon ring) from within the arc of hexes marked with a red "X". A lowest-move path to the hole in the ring from one of these hexes would have either a one-in-two (for hexes at the edge of the arc) or a one-in-three (for hexes within the arc) chance of passing through the wounded-dwagon hex; a lowest-move path to the hole in the ring from outside this arc will never pass through that hex. (White hexes represent terrain undisclosed by the comic; see Figure 2 caption). Jillian initially hesitated, because she was under the influence of a spell. However, she broke the spell, and, after sending a message to Ansom, led an attack on the dwagons. The battle ended with the destruction of Parson's entire raiding force. The croaking of all the A dragons and their warlords resulted in Stanley losing faith in Parson (and Wanda and Sizemore). He lashed out at them angrily and told them them to stay out of his sight or risk being disbanded. He then recalled all the field units, including the remaining dwagons from the ring. He also ordered the linked casters running the command-and-control table to unlink, in order to free up the Foolamancer to cover his flight from Gobwin Knob. This move crippled Gobwin Knob even further. This page was last edited on 5 May 2011, at 11:53.